Hollywood Writer Chooses Simpler Life As A Teacher! 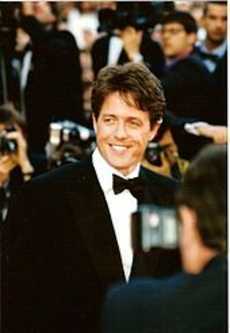 Keith Michaels (Hugh Grant) has once captured the celebrity world in Hollywod when he won the Academy Award-winning screenplay for a picture called Paradise Misplaced. But the limelight was just short-lived especially when his wife abandoned him for his film’s director. The worst thing is when his son seemed to be mesmerized by his rich and famous stepdad. Lonely and discouraged, Keith decides to follow his agent’s (Caroline Aaron) suggestion to take a temporary teaching position as writer-in-residence at Binghamton University in upstate New York. This way, he’ll at least be collecting a salary and, who knows, he might even find the inspiration for another Oscar-worthy script. That is the promising premise of The Rewrite, a delightful romantic romp written and directed by Marc Lawrence (Miss Congeniality). The movie marks the fourth collaboration between Lawrence and Hugh Grant, following Two Weeks Notice (2002), Music and Lyrics (2007) and Did You Hear about the Morgans? (2009). The picture pairs Grant with Marisa Tomei as the lovebirds fated for one another, and it features a colorful supporting cast of characters played by J.K. Simmons, Allison Janney, Bella Heathcote and Chris Elliott, to name a few. The plot thickens soon after Keith arrives on campus. First, he makes the mistake of allowing himself to be seduced by a student (Heathcote) willing to do anything to land one of the ten spots in the visiting celebrity’s class. Against his better judgment, Keith embarks on a lust-fueled affair with the star-struck teen before he has a chance to date a more age-appropriate mate. That would be Holly (Tomei), a well-preserved, middle-aged mom also about to matriculate in his coveted course. The illicit student-professor liaison comes to the attention of Mary Weldon (Janney), the imperious head of the school’s Ethics Committee. The disapproving bureaucrat gives Keith the hairy eye every time they pass each other in the halls, and is eager for an opportunity to kick him off campus. Luckily, Keith has a couple of colleagues in his corner, Jim (Elliott) and Dr. Lerner (Simmons). These peers are willing to run interference since they’d prefer him putting down permanent roots in the region. Meanwhile, the more contrite Keith and cash-strapped Holly get to know each other, the more Binghamton looks like the ideal setting for a happily-ever-after ending. How come Hugh Grant and Marisa Tomei waited this long to make a romantic comedy together?